As we approach Apple’s World Wide Developers Conference (WWDC) scheduled for June 11, more rumours are coming in with all the features that we could expect in the next iteration of the iOS. And if one of the rumours is to be believed then Apple’s much appreciated virtual personal assistant, Siri is bound to arrive on the new iPad and probably also on the iPad 2 with the release of iOS 6. According to the source, Apple is testing Siri on both iPad 2 and the new iPad but there is no confirmation if the iPad 2 would eventually get Siri or not. It seems that Apple is not interested in keeping it restricted to the new iPad just like it did it with the iPhone 4S. One thing that we do know about the Siri for iPad is that, it would not be a full-screen function on the iPad but instead occupy only a limited space, overlaying on the current screen that you were running. The launch of the Siri app would remain the same, from the Home button. 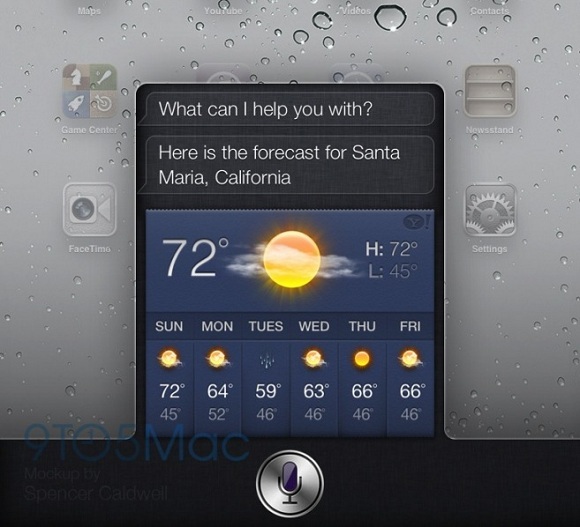 But Siri will slide up from a tray at the bottom of the screen as you can see in the mockup above.